Histological techniques 5. Histochemistry. Atlas of plant and animal histology. Here, we are dealing with techniques that include chemical reactions involving molecules of the tissue (immunohistochemistry and lectin histochemistry are described in the next pages). The goal of histochemistry techniques is to detect specific molecules in tissue sections and therefore it is posible to study their distribution "in situ", that is in the tissue. These molecules can not be readily distinguished by general staining techniques. The tissue has to be treated to reveal the molecule we are interested in. Histochemical techniques can be divided in two groups: chemical reactions and histo-enzymology. Chemical reactions are modifications of tissular molecules that allow them to be colored. There are histochemical procedures for staining carbohydrates, proteins and nucleotides. PAS (Periodic Acid Schiff) is the most popular histochemical technique for detecting free or conjugated carbohydrates that can be visualized when they are relatively abundant in the tissue (Figures 1 nad 2). The chemical modification consists in the oxidation by periodic acid of close carbon links that have hidroxyl groups. This reaction forms aldehyde groups that are recognized by the Schiff reactive providing a brilliant red color. Schiff reactive contains pararosaniline (a component of the basic fucsin), which has been previously treated with sulfuric acid. PAS technique is able to discriminate different types of carbohydrates by adjusting the procedure. Figure 1. Haematoxylin-eosin staining (on the left) and PAS-haematoxylin (on the right) staining of human intestinal crypts in transverse view. 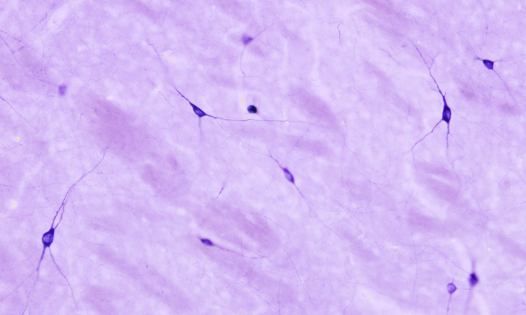 Globet cells are stained in pink with PAS histochemistry because of high content in mucopolysaccharides, whereas in the general staining they are not stained. Nuclei are stained with haematoxylin. Figure 2. PAS-haematoxylin procedure on paraffin sections. Steps with green letters include the histochemical reactions. Histoenzymology, or enzyme histochemistry, is based on the capacity of some enzymes to keep their activity after the tissue fixation. These enzymes, and the cell they are located in, can be visualized after the conversion of soluble and colorless substrates in insoluble and colored products by the enzyme activity. Substrates are specific for the enzyme and the products precipitate in the place where the enzyme is. There is a diversity of enzymes that can be detected with this method, such as peroxidases, phosphatases, dehydrogenases, diaphorases, acetylcholinesterase, and some others. It should keep in mind that fixation and embedding of the tissue may affect the enzyme activity. 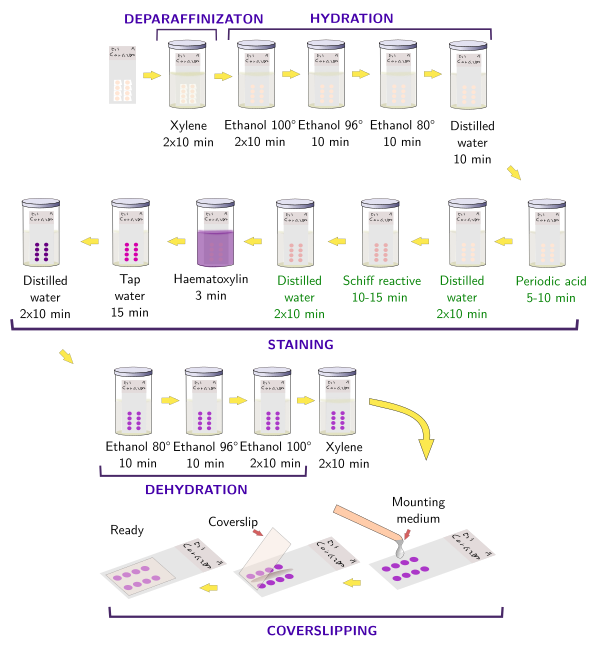 Embedding should be avoided because dehydration and high temperature may damage the enzyme and therefore its activity. That is why histoenzymology is mostly done on freezing or vibratome sections, where no embedding is needed. NADPH diaphorase activity in the nervous system is performed by the endothelial and neuronal nitric oxide synthase enzymes. Nitric oxide has been involved in the control of the blood flow and neuronal activity. By using histoenzymology, neurons (Figure 3) and endothelial cells expressing these enzymes can be quickly and easily identified in tissue sections. The enzymatic reaction is: NADPH + nitroblue tetrazolium = NADP+ + formazan. Formazan is the colored and insoluble product of the reaction that can be observed at light microscopy. An interesting property of formazan is some electrondensity, so it can be also observed at transmission electron microscopy. Figure 3. NADPH diaphorase histoenzymology. NADPH diaphorase activity in a 60 µm section of a rat brain. Neuronas expressing nitric oxide enzyme are colored in dark blue. NADPH diaphorase procedure. After fixation, ideally by perfussion, membranes are permeabilized with a lipid detergent like TX-100. The developing step is done at 37 ºC and the final staining intensity is controlled at the microscope. 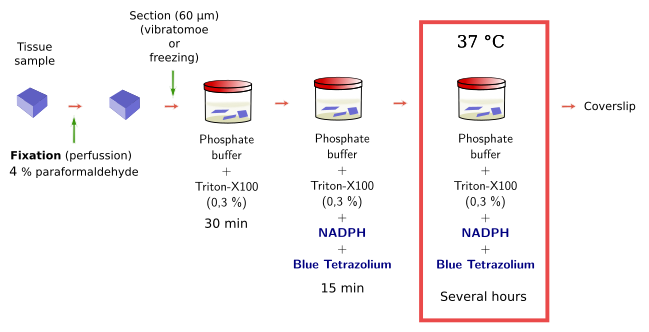 The concentration of NADPH and blue tetrazolium salts may change depending on the tissue and fixation.